June is National Pet Preparedness month. 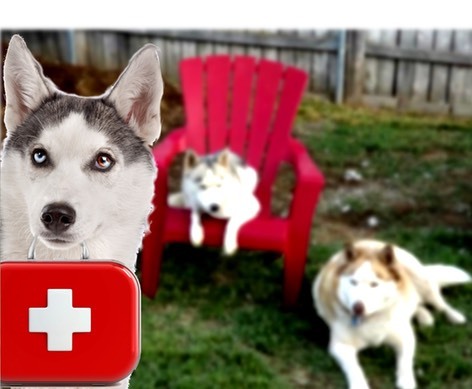 Here is a short list of some essentials for your husky's Emergency First Aid Kit. A digital, non mercury, rectal thermometer. Use with a lubricant such as Vaseline.The normal temperature for a dog is 100-102.5. A temperature reading above normal should be seen as a red flag, and the dog should be taken to your animal clinic as soon as possible. A temperature of over 105 is considered an emergency situation. Tweezers. To remove bee stingers, splinters etc. Sterile gauze pads (4" by 4"). Roll of gauze or vet wrap and white tape. Cotton balls and Q-tip cotton swabs. For cleaning small wounds. Styptic pencil (which can sting a bit) or a small bottle of ferric sulfate powder (AKA, Kwik Stop which can be found at the pet store). If you trim your husky's nails too close to the quick and it begins to bleed, then pack the nails with this powder and it can help stop the bleeding. (in an emergency you can use flour). Tick remover. Makes it much easier to remove an embedded tick. Too often people pull or burn ticks off, which leaves the head inside the animal's skin. Read more about ticks here. A muzzle. Sometimes even the most docile and well behaved dog may react with a snap when they are in pain and afraid. Towel or blanket, not only to keep them warm, but also to wrap them up and carry them into the clinic. Aspirin comes in 81mg and 325mg. The dose for dogs is about 81mg per 10-20 pounds or 325mg per 40-50 pound. However, give no more than twice a day until you talk to your veterinarian. Benadryl is an over the counter medication that comes in a 25mg tablet or capsule. This may be good for dogs with allergies or for instances when they have a reaction to an insect bite. In this case the dose is 25mg per 25 pounds, up to a maximum of 3 times a day. There can be some side effects with Benadryl which may include sedation or, rarely, hyper-excitability. Pepto-Bismol can be given to a dog with diarrhea, administering one dose of 1cc per pound up to 2-3 times a day. Be aware that this can cause dark colored stools, however, this is harmless. Keep a can of pure pumpkin in your pantry, a few spoonfuls will work wonders to clear up diarrhea (pure pumpkin NOT pumpkin pie mix). Hydrocortisone cream can be used for small areas of itchy skin, allergic reactions or insect bites.